We are happy to announce that version 11.14 of EmailSuccess has been released. This version brings new features that allow you to pause AutoTuning, improvements to STARTTLS protocol management, updated documentation, security improvements on user passwords and much more. 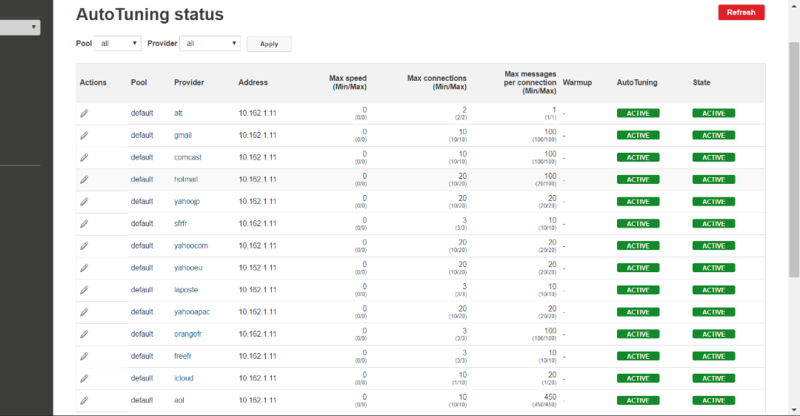 Thanks to a new page called AutoTuning Status, you will now be able to view and modify the status of AutoTuning (forcing values for max speed, max connections and max message per connection) for IPs and providers. You will also be able to pause AutoTuning or temporarily disable the IP for the IP / provider combination. You can find more information in the Technical Guide, under AutoTuning. The default behaviour of EmailSuccess when it encounters a server that does not offer the STARTTLS extension is to send in “plain text”. Now, you can configure EmailSuccess to force sending failure in these instances (RequiredStartTLSException error) by using the require_startts flag, which can either be provider-specific or global for all non-providers. Furthermore, EmailSuccess can generate a temporary bounce if it encounters such a server. You can find more information in the Technical Guide, under Provider -> StartTLS. We have released the new API Documentation and updated the QuickStart Guide. The command tools-connection-tester now allows testing IP addresses and domain names. The new version of HerdDB with Calcite is currently supported. Security improvements on user passwords.